Autumn is here at last! It was a beautiful weekend. I opened all the windows in the house, and let the breeze carry through the rooms. It is nice to finally be out of the triple digit heat. Now we get to enjoy mid-to-high 90's weather for the next couple days. Summer's last ditch effort to hang on? I took advantage of Aarti's two week event, A More Diverse Universe, to get in some extra reading. I reviewed a couple of children's books, When Gorilla Goes Walking by Nikki Grimes and Shane Evans and Round Is a Mooncake by Roseanne Thong and Grace Lin, to start off the event, and have since also read a young adult fairy tale re-telling of Cinderella called Ash by Malinda Lo, a fiction novel about a Pakistani woman living in New York City during the 9/11 attack called Saffron Dreams by Shaila Abdullah, and a thriller, Confessions, by Japanese crime fiction author Kanae Minato (review will post tomorrow). It just so happened that one of my From the Archives reviews met the requirements of being a book by an author of color as well: A Space Between Us by Thrity Umrigar. I am now back to my regularly scheduled reading, having finished a new one by Heather Graham called The Betrayed for an upcoming tour. It's the fourteenth book in her Krewe Hunter series, a paranormal cozy mystery romance series featuring ghosts. This one is set in Sleepy Hollow in New York, drawing on the area's history. My current read has taken me to the Caribbean where I have joined a reporter for a look into an old crime in which two boys brutally killed their parents. 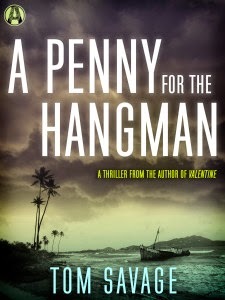 Murder and mayhem ensue in A Penny for the Hangman by Tom Savage. Oh! Read-a-longs are hit and miss with me, but when I saw Samantha from Booked on a Feeling mention the Fingersmith Read-A-Long hosted by the Literate Housewife scheduled for next month, I decided to take the plunge. I already have a copy of the book, so what's to stop me? Not to mention I have wanted to read something by Sarah Waters for forever and a day. It's about time, don't you think? And what better month to do that than in October? Have you read it? Do you want to? This is a day unlike any other day, ever, in the history of the world. It is my birthday, and it is my new beginning. I, Rodney Lawson Harper, am 15 years old old today, and I have a wonderful plan. I must write it down. The ideas are arriving so thick and fast, my mind is so feverish with them that it is all my hand can do to keep up with my head. But my hand will prevail. As on a chessboard before a match, I'll set the pieces out in order, row on row. Everything will be perfect. We're having cooler weather today but it's going to warm back up. I'm glad because I'm not ready to let go of summer. Kathy - The weather here is on the upswing, but will dip back down soon--and then up again from what the meteorologists are saying. I would be happy with temps in the 80's. Just don't take me back into the 100's, please. I enjoyed reading your reviews on the books you read for the A More Diverse Universe Challenge. A Penny for the Hangman sounds intriguing. Melody - Thank you! I really do need to get back to reading more diversely on a regular basis. A Penny for the Hangman sounds interesting. I have The Betrayed but I haven't gotten to it yet. I do always enjoy Graham's books. They generally have some flaws but they're always fun. We all of a sudden decided to have fall temperatures and I'm freezing! I'm not sure I want temps in the high 90s again but I'm not sure I'd turn down low 90s! Katherine - It is so far. It's not quite what I expected! I hope you enjoy The Betrayed when you get to it. :-) It was a fun read, but, as you said with her books, not without its flaws. I think our weather is down to the nineties, for the most part....but it goes up and down...sigh. I love the opening lines of A Penny for the Hangman...there is definitely a sense of foreboding. I would keep reading. Laurel-Rain - Yes, it's the same here. Mother nature can't make up her mind. I am enjoying A Penny for the Hangman so far. I'm not quite a third of the way in yet and that foreboding feeling is still there. I think I'd want to know more before I commit, but it sounds promising. I've never done a read-along. Hope it works out for you. Kim - So far it's good. I love a good mystery. I kind of liked that kid's voice. I'd need to see a bit more about the premise of the book, but I'd probably keep reading at this point. Sarah - He's an interesting character so far. The narration of the story is quite interesting. I'm curious to see what the author does with it as he goes. Amazing the places books take us. Definitely a book I'd carry on reading as I'm already feeling rather sorry for Rodney and his assumption that everything will be perfect. I'm not sure Rodney is worth feeling sorry for at this point, but, yeah, nothing is ever perfect, is it? I AM SICK OF THE HEAT!!! SICK SICK SICK!!! Oh how I'd love to open a window, but probably not a likely thing for at least another month or two. And Fingersmith? Absolutely an amazing novel. Her best I think, but you'll want to read her others after that. Sandy - I wish the cooler weather would stick around. I'm ready to say goodbye to the heat too. I have heard nothing but wonderful things about Fingersmith and the Waters. I am looking forward to finally giving her work a try. If the blurb was interesting, I'd read on. Suzie - It was enough to get me interested! I love the cover of Fingersmith. If you have a few minutes in your schedule, here's my FCFPTI. I agree! I wouldn't be in Karen's shoes for anything! Not sure if I would read this one, but it certainly starts out interestingly. So many books, so hard to choose. Thanks though, for the introduction. Judy - Sometimes choosing what to read next is the hardest part. I do like the intro and would keep reading. I have not read anything by Sarah Waters. We are enjoying a beautiful first week of fall here in Michigan. Nise' - I bet Michigan is beautiful in the fall. 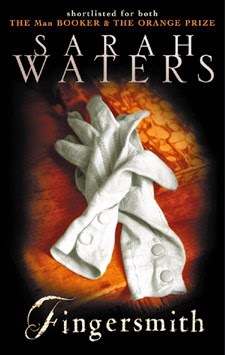 I have heard wonderful things about Sarah Waters, so I hope my expectations are not too high! Sounds interesting. I hope you like it. Paulita - I am enjoying it so far. Yvonne - It is so far! I wasn't able to read much today, but hopefully more tomorrow. I love fall as well - the weather has been awesome here. Diane - It does pull you in and get you curious, doesn't it? Deasy - I am enjoying it! All the books you've recently read sound interesting -- nice locations and genres. I haven't heard of many of them, so I'm off to find out more. Thanks for visiting my blog. Hope you get more cool weather -- autumn is definitely in the air here in NY. We're supposed to be getting cooler weather tomorrow. Fingers crossed!